Recent blogs have explained many reasons (biodiversity, stream restoration, water storage, spiritual growth, and salmon restoration), why we all should give a damn about beavers and the dams they build. In case all those reasons weren’t enough, here’s another: improved water quality. Viewed from space, Earth is a water planet. Yet 97.5% of our planet’s water is undrinkable saline. 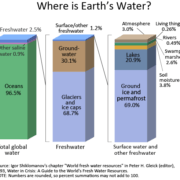 Only 2.5% of all water is freshwater, and the majority of that is locked up, frozen in glaciers and polar ice. Surface freshwater makes up only 0.03% of all our planet’s water. We need to protect this life giving resource. Beavers can help! How cool is that? Did you know that freshwater wetlands have been appropriately dubbed by the US EPA and others as the “Earth’s kidneys”? Just as real kidneys filter our bloodstream to remove unwanted waste products and contaminants, freshwater wetlands also remove unwanted fertilizers, toxic metals and sediment from our streams. This results in cleaner water. Research articles in the Beaver Institute library reveal how beaver ponds remove unwanted Nitrogen and Phosphorous fertilizer runoff in streams. To apply this knowledge, Pattama and Scott Ulrich in OH have recently partnered with the Beaver Institute, an Ohio State University research lab, and the Ohio Farm Bureau Foundation to study the effect of beaver dams and Beaver Dam Analogs in reducing farm soil sediment and fertilizer runoff into streams in Ohio. Fertilizers contain large amounts of nitrogen and phosphorous, which are ideal for growing algae once these nutrients flow downstream and accumulate in large bodies of water such as Lake Erie. These nutrients cause toxic algae blooms that create large “Dead Zones” devoid of fish and other forms life. These “Dead Zones” are major environmental problems in Lake Erie, the Gulf of Mexico, and many other locations. The Ulrich “Beaver Wrangler” Team hopes to further our scientific understanding of how beaver impoundments can help improve water quality runoff from farms. In addition to removing unwanted nutrients, the water downstream of beaver dams is also less turbid and cleaner because it carries less sediment. There are two reasons for this. First, impounded water in beaver ponds moves slowly which reduces stream channel erosion. Second, the slowed water drops many suspended particles as sediment on the pond bottom. The remaining water is cleaner. Another mechanism how beaver ponds clean our surface water is by removing toxic metals. Yes, that is true! Some of this is achieved by sedimentation, but wetland plants and algae also pitch in. It turns out that wetland plants and algae are able to chelate, (bind and remove) these toxic elements from the water. Chelation is achieved through a process called phytoremediation. where plants and algae use photosynthesis to bind and remove toxins such as lead, arsenic, copper, cadmium, mercury and selenium. This natural process is currently being researched because it holds promise as a safe and inexpensive method of commercial environmental clean-up. Beaver ponds do all these things to improve our water quality. So cleaner water is just another reason to “Give a DAMn about beavers. So the next time you hear someone refer to the green water in a wetland as ugly, scummy, slimy, or some other negative descriptor, please point out that those plants and algae are working naturally with beavers FOR FREE to clean our water. If you have a question, comment or would like to share your own story please Contact Us or go to our Beaver Institute FB page.